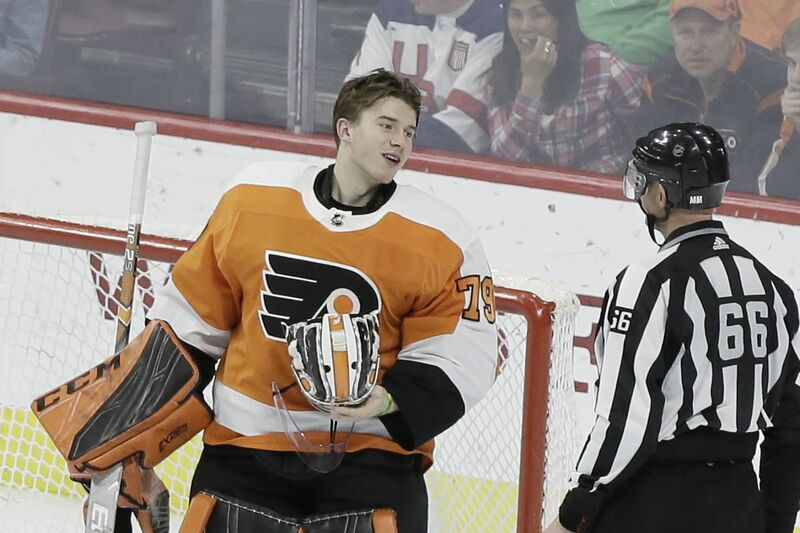 “I see nothing but sunshine for this kid, that’s for sure," Flyers legend Bernie Parent said of new star goalie Carter Hart. The greatest goaltender ever to play for the Flyers, Bernie Parent, brought up the name of arguably the best player in NHL history, Wayne Gretzky, when discussing Carter Hart the other day. Parent, a Hockey Hall of Famer, likes a lot of things about the cerebral rookie goalie. Entering the weekend, Hart has a 15-10-1 record with a 2.66 goals-against average and .922 save percentage. The Flyers’ three-decade search for en elite goaltender appears to be over. “He’s won a lot of games for us by himself," center Sean Couturier said. And he’s only 20 years old. Dallas’ Ben Bishop takes a league-best .932 save percentage and a 2.05 GAA into the weekend. At 20, he was still in college, playing for the University of Maine. Vegas goalie Marc-Andre Fleury, who has a good chance to reach the Hockey Hall of Fame, had a cup of coffee with the Penguins when he was 19 — he struggled mightily in a 22-game stint — and was back in the AHL for parts of three seasons before reaching the NHL for good. St. Louis’ Jordan Binnington, the hotshot 25-year-old rookie who has a league-best 1.79 GAA and .929 save percentage entering the weekend, played mostly in the ECHL when he was 20. The point is, Hart is much more advanced than most of this year’s hotshot goalies at a similar age. Even Parent, who led the Flyers to Stanley Cup championships in 1974 and 1975, was still trying to find himself when he was 20 and in his first NHL season. Playing as a rookie for the Boston Bruins in 1965-66, Parent had a 3.69 GAA and .898 save percentage. It’s not fair, of course, to compare stats from that era to today, when goalie equipment is much larger. “Different game now,” the always-jovial Parent said. Hart’s instincts, Parent said, would be impressive in any era. The Flyers are giving up too many shots and too many quality chances in front of Hart. But as time goes on, Hart’s teammates will feed off his strong play, Parent said. “When a goalie plays like he does, the defense and the forwards have great confidence in what he’s doing, and it allows them to take chances sometimes because they have the goaltender behind them,” Parent said. Parent was asked if Hart reminded him of any goaltenders he has seen through the years. “Well, when he plays well, he reminds me of me,” he said. After a long pause, Parent broke into laughter. Parent, still fit at 73, said it’s good to have another goalie as a role model. For him, it was Jacques Plante. Parent’s career with the Flyers took off in his second stint with the club, after he had spent two years as Plante’s teammate in Toronto. Many think the tutelage he received from his boyhood idol was the difference. Since he was a kid, Hart has idolized Montreal’s Carey Price. Like Hart, Price reached the NHL at 20. Price had a rookie year (2.56 GAA, .920 save percentage in 41 games) similar to Hart’s. Parent said that he doesn’t want to interfere with Hart’s routine, but that he plans to meet him for the first time after the season. Even a 20-year-old rookie who has taken the league by storm.